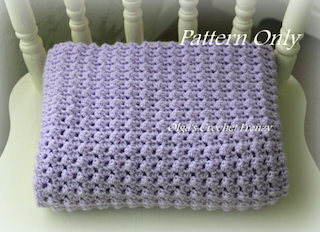 In my previous post, I shared my step-by-step tutorial how I add simple crocheted trim to a handkerchief. 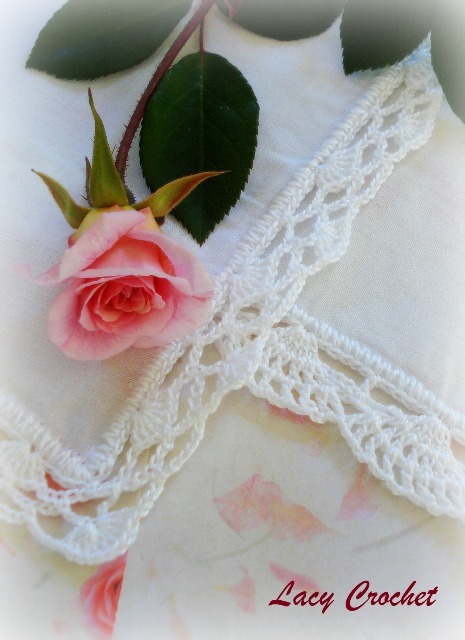 Today I want to show you some more pictures of hankies with lace trims, which I made some time ago. I did share my symbol charts for these edgings back in 2011. But I thought I’ll post the pictures (and the links to the charts) again as they might make more sense now. On all of these handkerchiefs I made a round of single crochets directly into the handkerchiefs first. Then I worked the lace rows. If you end up with extra stitches that are not enough for a pattern repeat, remember my tip from the tutorial: unravel a bit of your work and make one (or a few, depending on how many extra stitches you have) pattern repeat(s) bigger by one space. Those slightly bigger pattern repeats will not be noticeable at all. 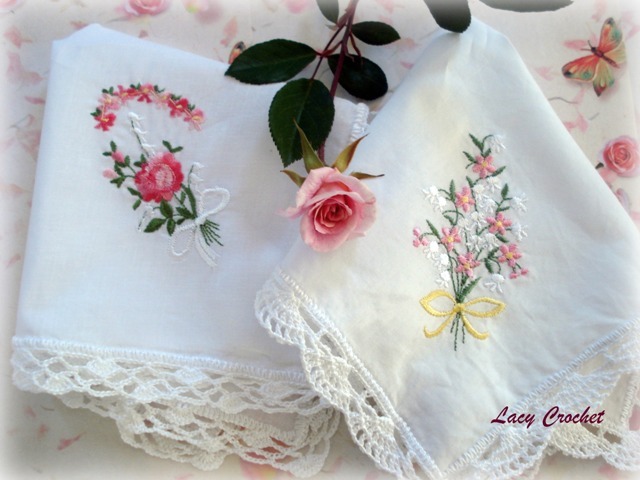 For the handkerchiefs shown above, I used a very thin hook (about size 12) and DMC #8 pearl cotton thread. The symbol charts are here. 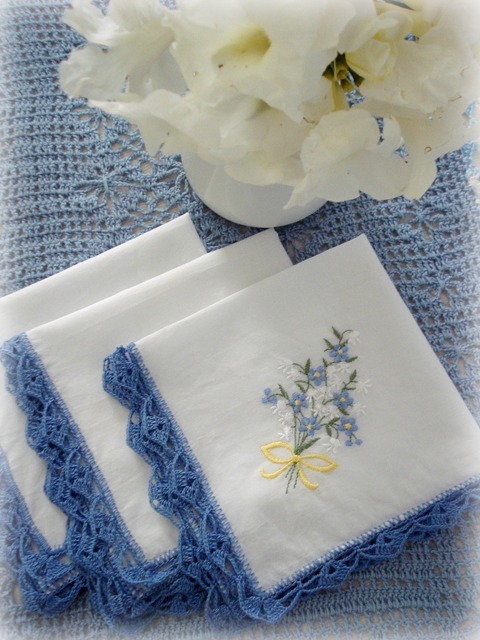 For the handkerchiefs with blue lace, I used the same thin hook and vintage Lily Daisy mercerized cotton thread number 20. The symbol chart pattern is here. I think adding a crochet trim makes a big difference on a hankie. It turns something plain into fancy. 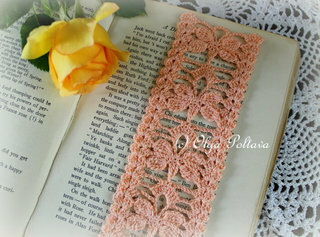 To add a scalloped crochet trim to my handkerchief, I used size 12 Boye steel hook and vintage thread Lily Daisy mercerized crochet cotton number 20. 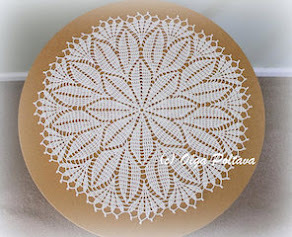 The thread is very fine and it’s similar to tatting thread. 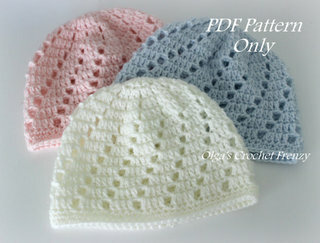 The first round involves making single crochets into the four sides of the handkerchief. The hook size is very small and the thread is thin, so it’s not an easy task. The stitches come out uneven, but as I continue and my hands get used to this task, they get better. When I get to the first corner, I make 3 sc in same space. Then I finish the round making the remaining three corners in the same way. I use a sl st to join the round. 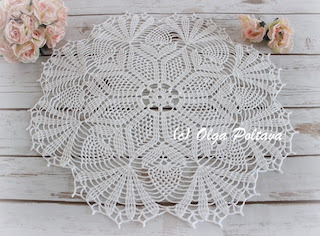 Here is my handkerchief with the round of sc completed. Next Round: *ch 9, skip 5 sc, sc in next sc* across. When I get to the first corner, I end up in sc prior to the corner sc. That was pure luck as I didn’t count the amount of stitches along the first side, and I didn’t know if it was divisible by 6 without a remainder. I make the corner loop in the following way: ch 7, skip 1 sc (that’s the corner sc), sc in next sc. 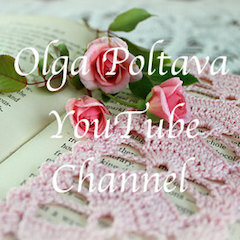 And again I continue making *ch 9, skip 5 sc, sc in next sc* along the second side of the handkerchief. When I get to the second corner, I am not as lucky as I was with the previous one. I see that I have two extra sc-spaces. To fix that problem, I unravel two last loops and make them slightly bigger: *ch 10, skip 6 ch, sc in next sc* twice. It won’t be noticeable at all that those two loops are slightly bigger than the rest. Then again I make the corner loop: ch 7, skip 1 sc (that’s the corner sc), sc in next sc. And I finish the remaining two sides of the handkerchief in the same manner. I have one extra sc on the third side, so I make one loop slightly bigger. And I have two extra sc on the fourth side, so I make two loops slightly bigger. I use a sl st to join the round. Finally, the third round is: *7 sc in next chain loop, sc in space where sc of previous row was made* around. Slip stitch to join the round and fasten off. My hankie turned out too lovely to be used for its intended purpose. Instead I placed it on my dresser as a doily. Looks cute. 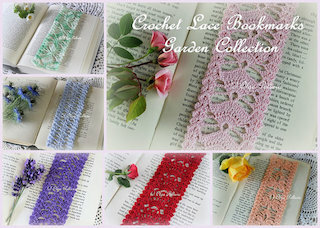 Today I’m joining Linda from Linda’s Crafty Corner for Summer 2013 Stash-buster Challenge Link Party! I have had this beautiful wool olive green yarn for a couple of years now. My sister-in-law bought it for me. I attempted a few projects with this yarn, but somehow none of them were ever finished. At some point I wanted to make a crocodile stitch shawl. But this stitch requires lot of yarn, so I abandoned that project because I probably wouldn’t have enough yarn to finish it. 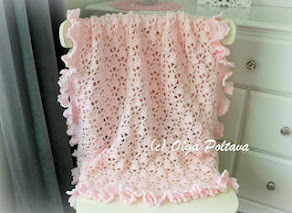 Besides, my shawl was coming out heavy and bulky. I also started an open-stitch project, which would require less yarn, but I didn’t finish it either. I think it was supposed to be a wrap, I’m not sure now. I even tried to knit something with this yarn, but again that project never materialized. I can’t even remember what it was supposed to be. I think I finally found a perfect project for this yarn. I’m making a lacy scarf. 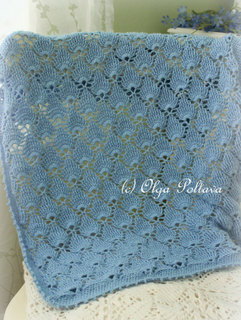 The stitch is open and airy, and the scarf is coming out soft and pleasant to touch. I think I might turn it into an infinity scarf; I’ll decide later. P.S. 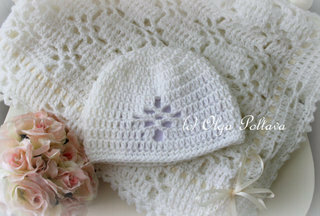 I’m going to take a short break from blogging and crocheting, but I have a few posts ready. They will be posted automatically. I’ll be back in a couple of weeks. 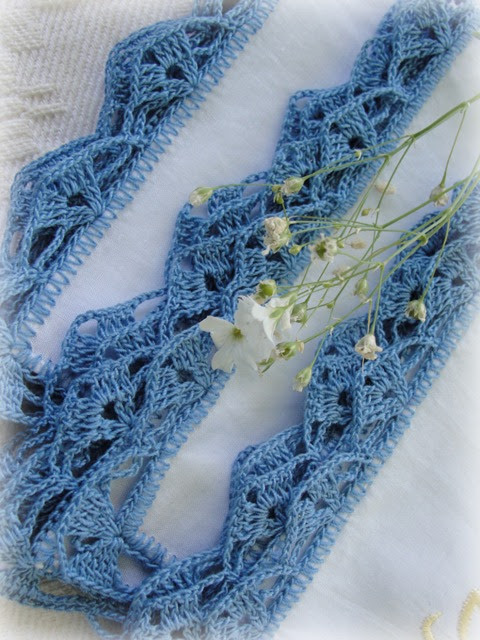 Here is another quick and easy lace stitch. 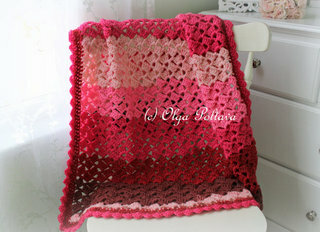 Even though autumn is still some time away, I plan to make myself a lacy scarf using this pattern. I have a very beautiful olive green wool yarn that my sister-in-law bought me some time ago. I think that yarn and this pattern will make a lovely scarf. Shell in this pattern: (2 dc, ch 2, 2 dc) all in same space. Multiple of 12, plus 6 for symmetry, plus 4. Row 1: shell in 6th ch from hook, *ch 3, skip 5 ch, sc in next ch, ch 3, skip 5 ch, shell in next ch* across, skip 3 ch, dc in last ch. Row 2: ch 6, turn; *sc in next shell, ch 3, shell in next sc, ch 3* across, end with sc in last shell, ch 3, dc in last dc. Row 3: ch 3, turn; *shell in next sc, ch 3, sc in next shell, ch 3,* across, end with shell in next sc, dc into 3rd ch of turning ch-6. Tomorrow my family and I will celebrate the Independence Day! 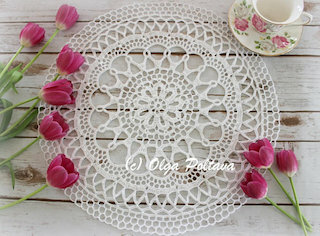 For the occasion, I made a doily in red, white, and blue (the doily in the original pattern was two-toned). I think I should’ve added a round of red in between blue and white. Because as I put a small vase with flowers on my doily, the red color got hidden under the vase. Oh well, I don’t have time to remake it, so it’s going to stay the way it is. For the bouquet I picked whatever was blooming in my yard. Not much effort and hardly any money (I only bought a ball of dark blue thread, everything else I used from my stash), and here I have a small cheerful centerpiece for the 4th of July. Happy Independence Day to those of you in the USA! 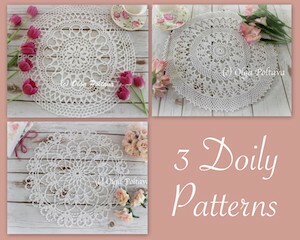 I found the pattern for the doily pictured above here. 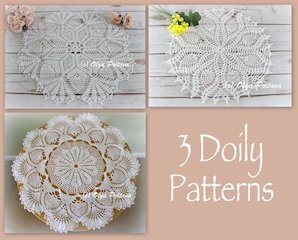 Since this vintage pattern is no longer covered by the copyright and is in the public domain, I repost the pattern below. 1st Round. 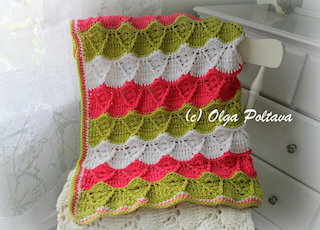 With Center Color chain (ch) 2, 8 single crochet (s c) in 2nd stitch (st) from hook, join in 1st s c.
2nd Round. Ch 3, double crochet (d c) in same space, * ch 2, 2 d c in next d c, repeat from * 6 times, ch 2, join in 3rd st of ch. 3rd Round. Ch 3, d c in next d c, * ch 4, 1 d c in each of the next 2 d c, repeat from * all around, ch 4, join. 4th Round. Ch 3, d c in next d c, * ch 3, d c in next loop, ch 3, 1 d c in each of the next 2 d c, repeat from * all around ending with ch 3, d c in next loop, ch 3, join. 5th Round. Ch 1, s c in same space, s c in next d c, * 3 s c in next loop, s c in next d c, 3 s c in next loop, 1 s c in each of the next 2 d c, repeat from * all around ending to correspond, join in 1st s c, cut thread. 6th Round. Attach White or Contrasting Color in same space, ch 3, d c in next s c, * ch 3, skip 2 s c, 1 d c in each of the next 2 s c, repeat from * all around, ch 3, join. 7th Round. Ch 3, d c in same space, d c in next d c, * ch 3, 2 d c in next d c, d c in next d c, repeat from * all around, ch 3, join. 8th Round. Ch 3, d c in same space, 1 d c in next d c, 2 d c in next d c, * ch 2, 2 d c in next d c, d c in next d c, 2 d c in next d c, repeat from * all around, ch 2, join. 9th Round. Ch 3, 1 d c in each of the next 4 d c, * ch 2, 1 d c in each of the next 5 d c, repeat from * all around, ch 2, join. 10th Round. Ch 3, d c in same space, 1 d c in each of the next 3 d c, 2 d c in next d c, * ch 1, 2 d c in next d c, 1 d c in each of the next 3 d c, 2 d c in next d c, repeat from * all around, ch 1, join. 11th Round. Ch 3, 1 d c in each d c and 1 d c in each ch 1 space, join, cut thread. l2th Round. Attach Edge Color (same as Center Color) in d c over the ch 1 space, ch 3, d c in same space, * ch 4, skip 3 d c, 2 d c in next d c, repeat from * all around, ch 4, join. l3th Round. Ch 3, d c in next d c, * ch 5, 1 d c in each of the next 2 d c keeping last loop of each d c on hook thread over and work on all loops at one time (d c joining), ch 5, 1 d c in each of the next 2 d c, repeat from * all around ending with ch 5, d c joining in next 2 d c, ch 5, join in 3rd st of ch. 14th Round. Ch 3, d c in next d c, * ch 3, 3 s c over next loop, s c in next d c joining, 3 s c over next loop, ch 3, 1 d c in each of the next 2 d c, repeat from * all around ending to correspond, ch 3, join. 15th Round. Ch 3, d c in same space, 2 d c in next d ch * ch 3, skip 1 sc, 1 s c in each of the next 5 s c, ch 3, 2 d c in each of the next 2 d c, repeat from * all around ending to correspond, ch 3, join. l6th Round. Ch 3, d c in next d c, * ch 3, 1 d c in each of the next 2 d c, ch 3, skip 1 s c, 1 s c in each of the next 3 s c, ch 3, 1 d c in each of the next 2 d c, repeat from * all around ending to correspond, ch 3, join. 17th Round. Ch 3, dc in next dc, * ch 2, 1 dc, ch 3, 1 dc in next loop, ch 2, 1 dc in each of the next 2 dc, ch 3, skip 1 sc, sc in next sc, ch 3, 1 dc in each of the next 2 dc, repeat from * all around, ch 3, join. 18th Round. Ch 3, d c in next dc, * ch 4, sl st in 3rd st from hook for picot, ch 1, d c in next loop, repeat from * once, ch 4, sl st in 3rd st from hook for picot, ch 1, dc in next loop, ch 4, sl st in 3rd st from hook for picot, ch 1, 1 d c in each of the next 2 dc, 1 dc in each of the next 2 dc, repeat from 1st * all around ending to correspond, join; fasten off.